Hope you guys had a wonderful weekend, if you follow me on Instagram you saw that we were partying it up all weekend, and now I am back in the saddle on clean living! I went to Soul Cycle for the first time on Thursday, and now here I am three sessions in and totally loving spin! I am not very good at it, but it is always fun to find new forms of exercise that I actually like- in fact it feels like a bit of a miracle. As far as clean eating, I still in that super grateful for seasonal produce and flavors mode right now and am very into what I find at the farmers market and the fresh herbs in my garden. Grilling, salads and fresh bold flavors are still what’s on our table right now and I have to share a recent delicious dinner with you. 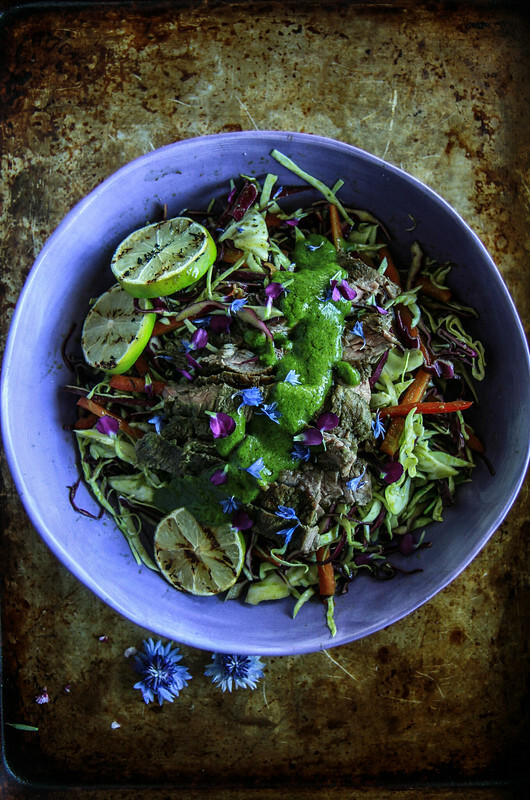 Super tender marinated grilled skirt steak and a fresh cabbage cilantro slaw make for an extra flavorful and healthy dinner that the whole family will love! Place the skirt steak in a large Ziploc and sprinkle with kosher salt. In the jar of a blender combine the cilantro, garlic, jalapeno, lime juice and olive oil. Puree until smooth and then season to taste with kosher salt. Take half of the cilantro sauce and add it to the steak in the bag. Seal the bag and refrigerate the steak at least a couple of hours and up to over night. Place the rest of the cilantro sauce in a Tupperware in the refrigerator. While the grill is heating, prepare the slaw, and then combine all of the ingredients in a large bowl. Grill the steak for 2-3 minutes on each side depending on thickness. Then remove from the grill and let rest for 5-10 minutes before thinly slicing against the grain. Toss the slaw with the rest of the cilantro sauce and season to taste with kosher salt. Serve the steak on a bed of slaw. Your girls are darling! Love that slaw! Your girls are just the cutest! 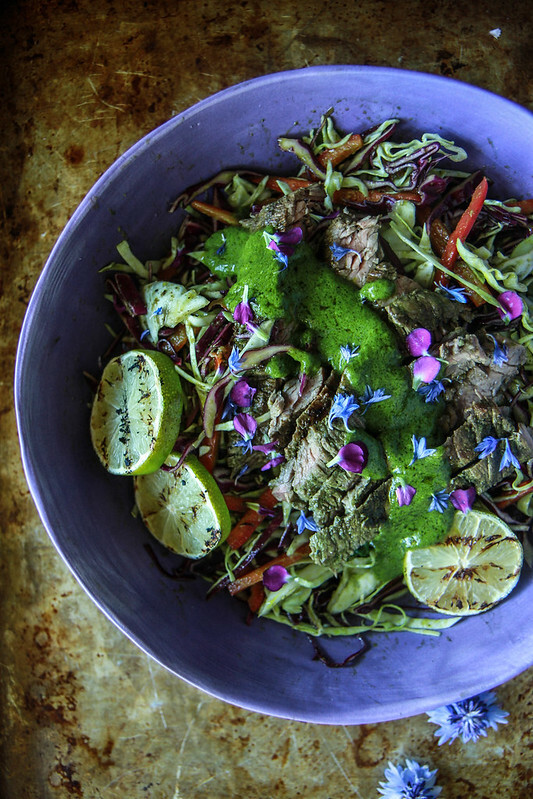 This is one gorgeous steak salad!